Enter a few keywords relating to your question. Many companies sell video surveillance equipment, but few truly support it. That's the SCS, Inc difference. We manufacture our systems and test all our components for compatibility with each other. We warranty every item we sell and we provide support via e-mail or on the telephone. We're with you from start to finish! SCS, Inc. will never share any personal information you give us online without your permission. We will not share your information with anyone or sell your information to other companies. If you would rather use the telephone to place an order or request information, please call us 1-845-369-1777. In this section you can find answers to the questions most frequently asked by our customers. The F.A.Q. section is continuously growing and being refined with the latest frequently asked questions and answers. Its the best place to start if this your first time needing support on our products. Do you offer installation with your products?? I think i duplicated my order. Can you check? What is the cost for the shipping and handling? What is the status of my order? Tracking number? When you order multiple items for a system, would all the items fit to each other? Do you offer the option to ship via USPS? I'd like to have my package sent to a p.o. box. Do you have a store that i could go to? Do you carry any camera detectors? Why do you need scans for international credit card? What is your repair policy and what can I expect?? Do you accept any other form of payment other than a credit card? Do you accept a PO? Can I make a special request at the check out? Why do I need to send in a disclosure on hidden audio system? I'm not comfortable scanning my card details and photo id to a company on the net. Is it safe? How fast can you ship a custom assembled item? Hi, how can you find out if any cameras were installed in my home with out my knowledge? What is the cost of shipping for an international orders? How long will it take to receive the order? I would like to place an international order. What will be the tax and duties? Can you reduce the value so I would pay less import tax? Why don't you post samples videos for all other cameras? All our systems are designed as 'Do it yourself' installations. SCS, Inc is simple enough that the majority of our customers can install it themselves. However, if you feel you would be more comfortable having a professional install the system we recommend calling a local electrician or handy man. They are considerably less money than a Security Dealer and have more than enough expertise to complete the work. Yes. we have automatic on-line discount system: Over $500.00 receive 5% off Over $1000.00 receive 7.5% off Over $1500.00 receive 10% off Over $2000.00 receive 12.5% off Over $3000.00 receive 15% off your entire order. We can ship to all countries listed on our shopping cart by EMS, DHL or FedEx. Please fill out the form at: Returns We'll get back to you with a return instruction promptly. Thank you. No problem all orders are reviewed manually and we'll not duplicate any orders. If you go through the process of ordering online, you will be given a total price including shipping and handling before committing to the order. Yes, if you just select the UPS option, since UPS does not deliver to PO, we'll automatically ship by USPS. Sorry, we only have one store in NY, USA. But we can ship to most of the countries by EMS shipping. For more information, please go to: International Orders . Thank you. Sorry, we do not have any walk-in service, mail order only. However we do stock items and can be shipped the same day of the order. Sorry we do not have a catalog since we have so many items being updated constantly and to maintain low price for customers. All updated information can be found at: www.spycameras.com and you can print out cutsheets for each items by clicking "print this page" located at upper right corner of the page. Thanks for your understanding. Sorry, we do not carry any counter surveillance items. However there are many companies online who sell them. 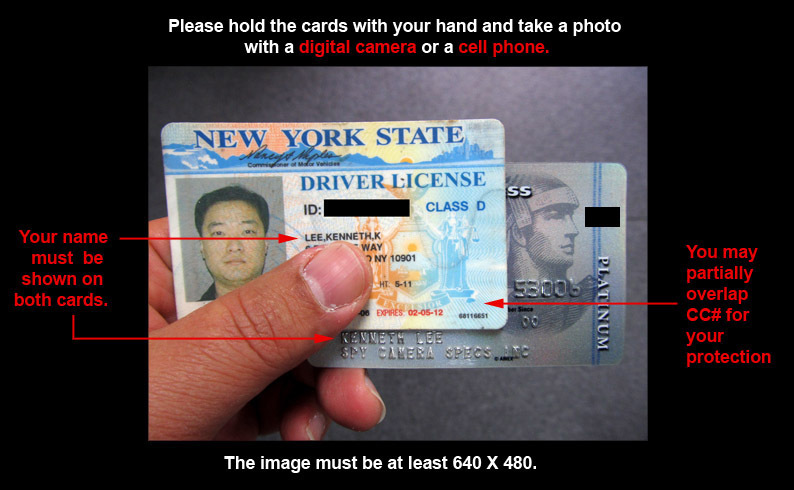 We can accept int'l VISA or MC but you must scan front and back of the credit card and your drivers license or passport and send via e-mail: info@spycameras.com The scans are used to verify the name on the credit card making sure the customer actually the owner of the card. All defective products that are within warranty are eligible for return for repair. You must submit a return an item form or call one of our representatives to issue an RMA number (return manufacturers authorization). All items being shipped back must be packaged correctly for them not to be damaged in shipping. We are not responsible for what happens to items during shipping and will not cover any damages due to shipping. We are also not responsible for any lost items in shipping. All items must have the RMA number written on the box to be accepted. We will do our best to get your repair or replacement sent to you as soon as possible. In most cases, products are repaired and shipped within 2 business days. Repair time is dependant on shipping time and whether the item is in stock. All DVR repairs are performed by professional technicians with 1000's of hours of bench experience. All DVR's sent in for repair are tested for 24 hours before being sent back out. Yes, If you many other method of payment at our shopping cart such as money order, western union, bank wire, check etc... When you check out, we'll send you further instructions. We do accept PO but only from a gov't & state agencies. Please fax the PO to 845-369-0888 with an authorized purchasing personnel's signature. Thank you. Yes, please indicate it on the "Notes/Requests" section at the shopping cart when checking out. Yes. Please go to: http://www.spycameras.com/customer-service/?id=dealer-inquiry and fill out the dealer application. Thank you. If you buy a microphone and hide it yourself, we have no problem, However, when we hide the audio module for you like in a all-in-one system at: http://www.spycameras.com/shop/cameras/all-in-one-camera/covert-cameras/ we need the signed form for you for legal purposes. We would only need the form in case of mis use of the audio by the customer. We can ship the same day of the order as long as the order is placed before 3:30 PM ET. The delivery time then depends on the shipping method you would choose? Yes, our name show as SCS Inc on the package and the name (SCS Enterprises Inc) on the credit card statement. Hi, you will need counter surveillance items, but we do not sell them. Search for "spy camera detector" in Google. When you go through the shopping cart process, it will fully inform you of the S/H charge & ETA before committing to the order. Also, it is solely customer's responsibility to pay any import duty, brokerage fee or any other taxes that may be involved. UPS GND is cheaper to Canada but there is $50.00 flat brokerage fee (plus tax & duty on top of the S/H). Best shipping method is by EMS or FedEx where there is no brokerage fee.. If you go through the shopping cart process, you will be informed of exact S/H charge before you commit to the order. Hi, we can ship to any countries listed on our shopping cart. We do not know the import tax rate for your country and the receiver is 100% liable for it. Please check with your local import agent. We can also lower the value if you wish (you can indicate the value at our "other request" section on our cart") but if there would be any problem with the package, we can only give you back the claimed amount since insurance value cannot be higher than the claimed value. Video quality of a camera really depends on the recorder that is connected to. Also, since cameras are analog, it need to be converted to digital format to post on the web, loosing resolution in the process. That is why we only have sample videos for "all in one system" that has a built-in digital recorder.